Tramway at Okhotny Ryad Street in Moscow. The humble tram has had many incarnations in Russian literature, from being seen as a kind of modern Charon's ferry, to a symbol of progress and the new age. 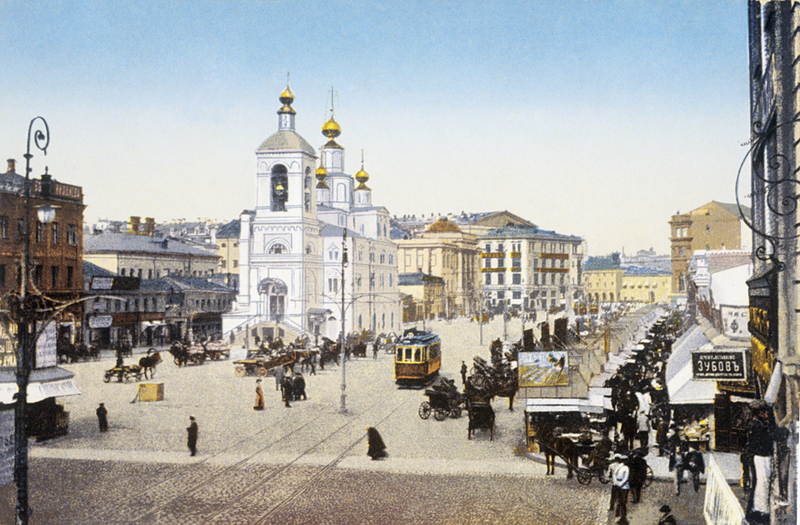 When the first electric tram in Russia appeared on Moscow's streets on April 6, 1899, it was an event that lived long in the memories of all who saw it. At first Muscovites were delighted by its comfort, speed and seeming technical perfection, but it soon became symbolic of danger and death. 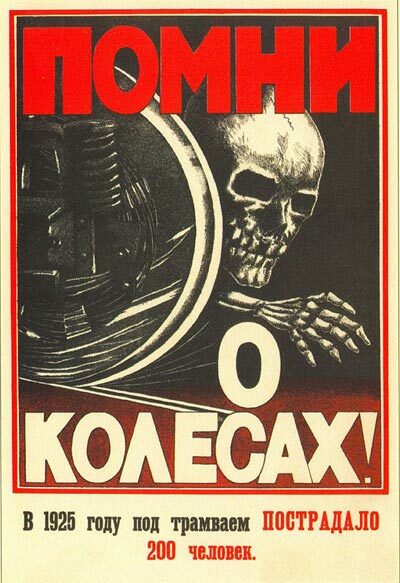 According to a famous poster exhorting citizens to "Mind the Wheels!" 200 people died as a result of tram accidents in 1925. Throughout the 20th century, Russian writers explored this tension between the desire for the modernity that the tram symbolized and the downsides it brought. During the first years after the Russian Revolution, the tram gained a rather mystical image for certain writers. In Evgeny Zamyatin's story The Dragon (1918) trams speed "out of the earthly world." Zamyatin describes the "dragon" himself, a small and malicious Red Army soldier, as "the conductor to the Kingdom of Heaven," saying that he temporarily "existed" on a tram platform. Here, on the platform, the main character wields power over other living beings, saving a sparrow from freezing to death and boasting about recently sending a human with an "intelligent mug" into the hereafter. In this short, metaphorical story, Zamyatin shows the tragedy of the revolutionary city, which, just like the tram in the text, is rushing into the unknown. Nikolai Gumilev's poem The Lost Tram (1921) follows a character who boards the vehicle to be carried "across the Neva, the Nile and the Seine" to the place where "Instead of cabbage and swede / Dead heads are sold." This poem was considered prophetic by Gumilev's peers and became famous after his death. In describing the poem's genesis, the poet himself remarked "I can't understand how it happened," explaining that he was crossing a bridge over the Neva when a tram suddenly sped past: "The tram's sparks appeared like a fiery lane against the pink sunrise. I stopped. I was penetrated with some kind of revelation. The wind blew in my face and I remembered something, something that happened in the past and at the same time saw what will happen in the future." Perhaps the most memorable tram in Russian literature is the one that slices off Berlioz's head in Mikhail Bulgakov's famous novel Master and Margarita. Modernity makes an appearance in this scene too, as the empty tram, which has no passengers or conductor is described as being "lit up inside with electricity" – the final image Berlioz sees before he falls under its wheels. The severed head and the spilled oil that leads to the accident have become cult images in Russian literary heritage. Will the legendary 'Annushka' tram return? It is possible that Bulgakov had a score to settle with the tram as a mode of transport, hence why it became his chosen executioner. The writer lived at 35a Bolshaya Pirogovskaya for many years, and the walls of his apartment would shake when chains of trams went by twice daily: early in the morning and after midnight. The image of the tram as linked to death also features in Boris Pasternak's book Doctor Zhivago. The eponymous character takes a tram that is continually breaking down for his final journey; he is able to jump out onto the road from his metaphorical coffin, but while inside he realizes that he "had torn something inside himself, that he had done something fatal." In Vladimir Nabokov's The Defense (1929), the chess player Luzhin takes a tram ride a few hours before taking his own life, while a female demon in Fairytale (1926) demonstrates her power by saying: "You see, there, a gentleman wearing tortoiseshell glasses is crossing the street. Let a tram run him over." In King, Queen, Knave (1928), Franz decides to use whether a tram's number is odd or even to decide whether his beloved Martha will die. Ironically, a tram races by with boarded up windows and no number. It is not quite a redemption for this often deadly mode of city transport, but in the context of Russian literature it is close. First published in Russian by Culture.ru.